Heat 1 inch water to boiling in a 3 quart saucepan. add potatoes and the 1/2 teaspoon of salt. heat to boiling; reduce heat to medium, cover and cook about 12 minutes until tender; drain and set aside. 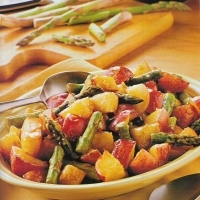 while potatoes are cooking, heat 1 inch water to boiling in a 2 quart saucepan; add asparagus, heat to boiling; reduce heat to medium ; cover and cook about 5 minutes or until crisp-tender; drain and set aside. while vegetables are cooking , melt butter in a 10 inch skillet over medium - high heat. cook onion in butter about 5 minutes stirring occasionally., until golden brown. stir in vinegar, brown sugar and 1/4 teaspoon salt. pour onion mixture over the potatoes and asparagus; stir until well coated. Sounds great..I will give it a try. The vinegar will caramelize too if you cook it long enough. The asparagus is coming soon great timing. I keep a bottle of Balsamic vinegar here all the time. I like it in recipes. This recipe, sounds so very delicious! Like minitindel's recipes? Never miss an upload!